Staff Sgt. Girard Gass, Jr., 33, of Lumber Bridge, N.C. died Aug. 3, 2014 of non-combat related injuries in Nangarhar Province, Afghanistan. 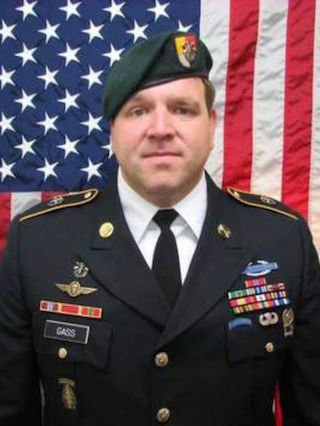 Gass was assigned to Company C, 1st Battalion, 3rd Special Forces Group (Airborne), Fort Bragg, N.C., and was deployed in support of Operation Enduring Freedom. This was Gass’ second deployment to Afghanistan in support of Overseas Contingency Operations. Gass enlisted in the Army in 2008 under the Special Forces Enlistment Option. Upon completion of Army Basic Combat and Advanced Individual Training, the Army Basic Airborne Course and the Special Forces Qualification Course, he reported to 3rd Special Forces Group (Airborne) as a Special Forces medical sergeant in 2011. Gass’ awards and decorations include the Bronze Star Medal, Army Commendation Medal with “V” device, Army Achievement Medal, Army Good Conduct Medal (second award) and National Defense Service Medal. Gass was posthumously awarded his second Bronze Star Medal and the Meritorious Service Medal. He was also awarded the Afghanistan Campaign Medal with one campaign star, Global War on Terrorism Service Medal, Army Service Ribbon, NATO Medal, Noncommissioned Officer Professional Development Ribbon (numeral 2), Parachutist Badge, Combat Infantryman Badge, and the Special Forces Tab.